After playtesting the Elspeth VS Tezzeret Duel Decks for an entire weekend, I decided I might as well review it. Let's dive right in shall we? The first thing you should know is that I'm honestly not that excited about artifact or solider decks and to make things even funnier for my perspective is that I'm not all that interested in Elspy or Tezz as characters. You're probably thinking I'm the last person that should review this but I'm here to surprise you. I love this product and I honestly think it's the greatest Duel Deck to be released for Magic the Gathering. If you're a collector then you've probably already bought four due to the alternate art and the fact you're getting a huge investment for the little you are paying for these. The regular Elspeth card costs more than the MSRP of this product by herself. This box set not only comes with an alternate art version of Elspeth and Tezzeret but two full decks with multiple rares in each. 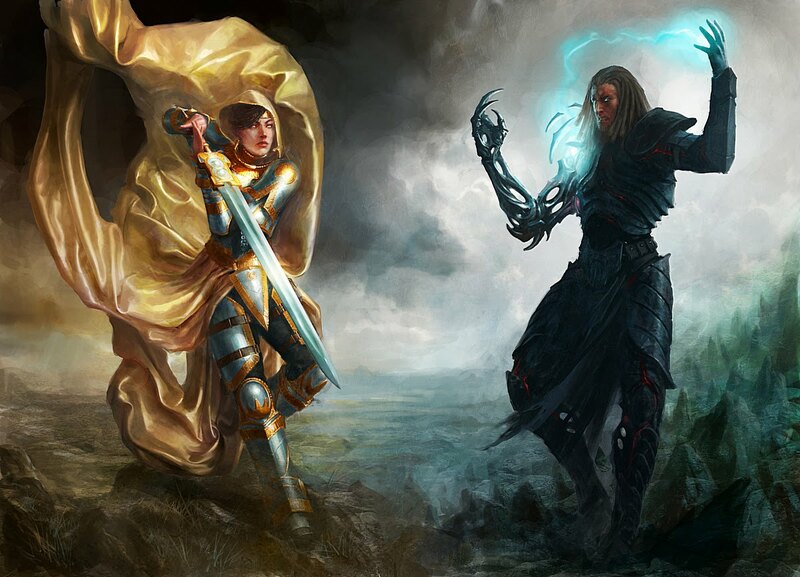 If you're a vorthos (storyline lover) then you have to get excited over the thought of taking sides with either Elspeth or Tezzeret. Whether you want to summon an army of soldiers to serve and protect or you prefer to create machines to gain power and knowledge, either way, it's going to be very metal. Throw up the horns and crank it to eleven! If you're teaching anyone to play Magic then this is one of the greatest teaching tools I've ever found in a stand alone product. That's how I've been playtesting this actually. I let a beginner run the Elspeth deck while I controlled Tezzeret's. The decks are surprisingly balanced and each deck provides just the right amount of variety and consistency for someone new to the game of Magic (or for someone with ADHD). There are plenty of other reasons to grab a box but these are a few I imagine most reviews online won't cover. This is Kylak signing out and giving this product the heavy metal award and an eleven out of ten stars because our amplifiers go up to eleven!